The stepping stones approach lets us use our alternatives of skills, tools and tasks according to the changing needs of the project. Still moving forward with the project, but crossing the boundaries with different skills, tools and tasks according the best approach at that time. Many project management methods already incorporate this method, understanding that one size does not always fit all. Stepping stones project progress with movement across stages to meet goals. 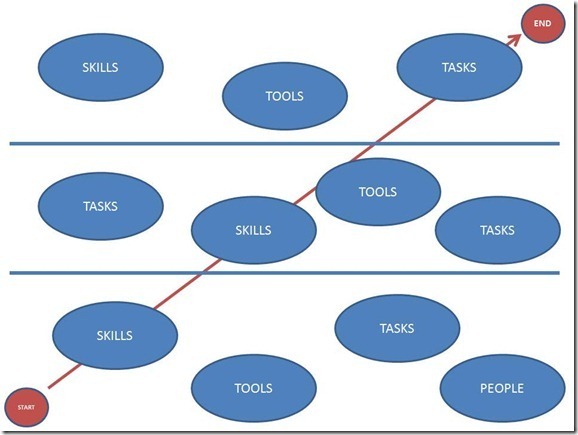 The way this works is to decide when you need to move from one level to another and which skills, tools and tasks you may need to get there. A more flexible approach yes, but one that really requires some experience and knowledge to know which steps are the right ones.